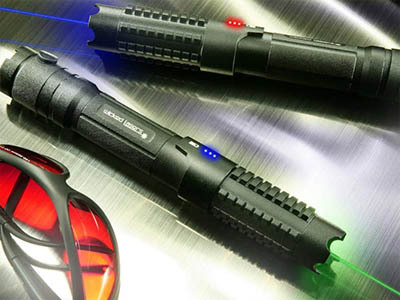 The first green handheld laser was a modified green laser pointer manufactured by Leadlight Taiwan, the first 532nm DPSS green laser pointer manufacturer in history. Power outputs were available from 15mW ($99) to 45mW ($299). 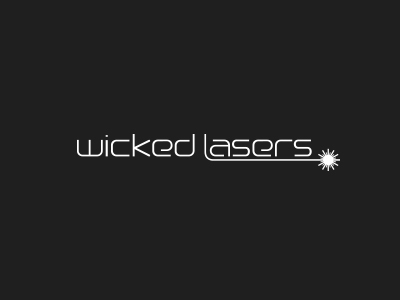 Wicked Lasers would later use a higher output pump diode capable of producing an output of 55mW ($399) to 125mW ($699). The first red handheld laser was created by harvesting the high powered, red diode of a DVD burner. The Pulsar series had an output of 100mW ($149) to 150mW ($199). 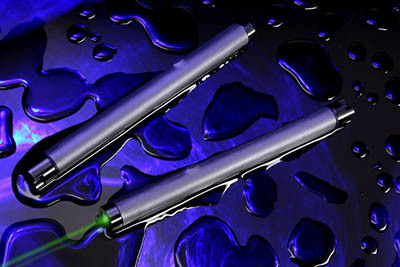 The Spyder I had an output of 40mW in the 473nm blue ($3499) and 300mW in the 532nm green ($1999). Crafted out of heat-resistant brass, it was fully waterproof, with a continuous duty cycle. 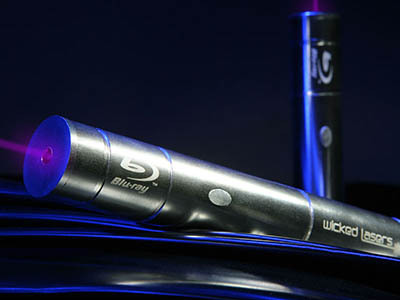 The Spyder I Series held the Guinness World Record for being the most powerful handheld laser in the world. The Sonar 405nm 100mW laser ($1999) was created from a diode harvested from the world's first Blu-ray player, the Sony BDP-S1. Later more powerful models were available by harvesting Blu-ray burners. 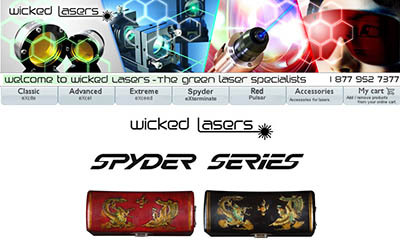 The next generation Spyder II was available in red 300mW ($1999), green 300mW ($1999), and blue 40mW ($1999). Its casing was crafted from T6061 aircraft-grade aluminum, making it lightweight and virtually indestructible. It was the first handheld laser to feature TEC cooling. The Photonic Disruptor was the first handheld laser designed especially for military applications. 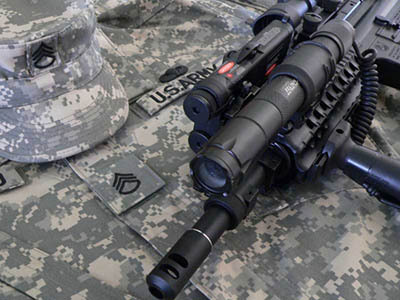 Its adjustable focus and waterproof casing allowed for maximum tactical versatility. 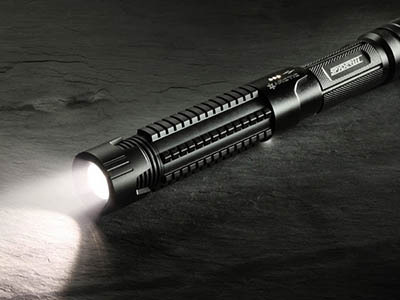 The Torch ($299) featured a 100W halogen bulb and a huge, yet low run-time Ni-MH battery pack which created 4100 lumens and enough scorching heat to set trees on fire and fry eggs. 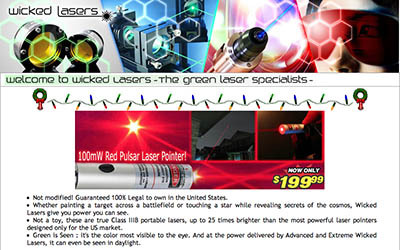 The Spyder III was the first class 4 laser available in 500mW green ($4999), 60mW green, ($3999) and 500mW red ($3499). Featuring mini lock safety technology, the Spyder III was fully compliant with laser compliance manufacturing requirements. Its aircraft grade aluminum, reinforced heat sink and tactical strike bezel made it the most advanced Spyder yet. The iconic Arctic 1 watt 445nm blue laser ($299) diode was harvested from a Casio laser projector. Equipped with a digital microprocessor, it requires a passcode for laser activation and features 9 function modes. Its immense popularity caused Lucasfilm to file a cease and desist letter over its "lightsaber-like design". As the story went viral, sales skyrocketed but the company was not able to keep up with demand. Many customers faced delays which ranged from 3-6 months before eventually receiving their order. After this debacle, the size of their production facility was upgraded which completely resolved stock issues to date. The Arctic laser was seen from outer space and mounted on a shark. 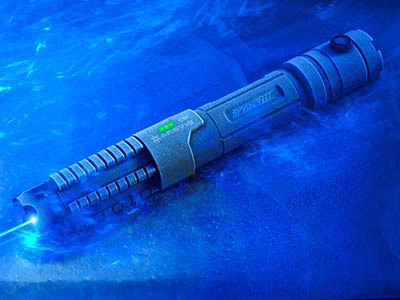 Using a remote, phosphor technology similar to the laser headlight technology used by luxury auto makers, the Phosforce lets you transform the power of the Arctic into the world's first laser flashlight. 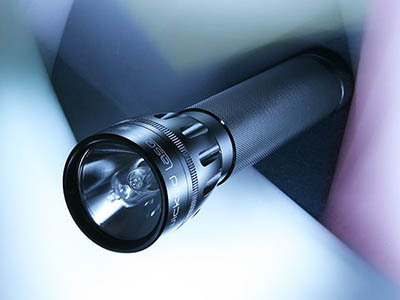 Up to 500 lumens can be created with this patent-pending adapter.